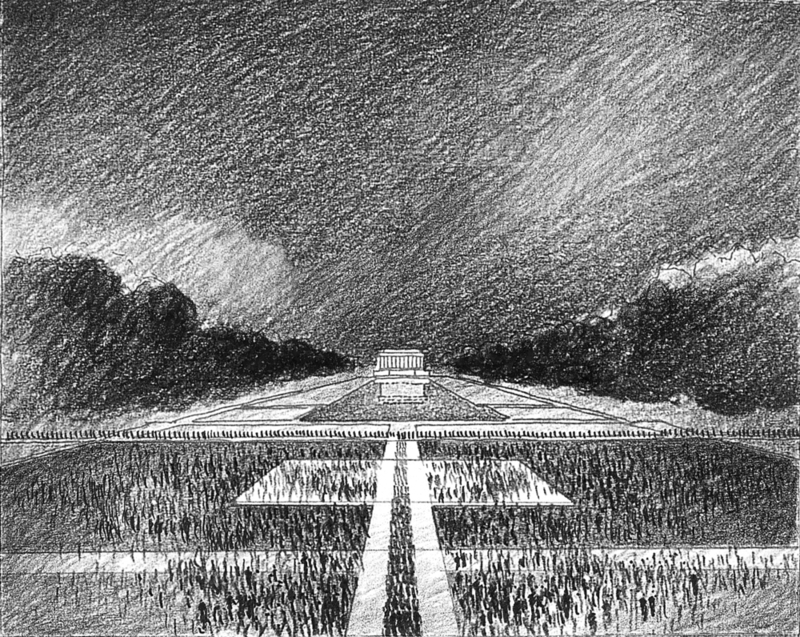 In 1996, an international competition for a national memorial to the Second World War garnered over 700 entries; five were selected as finalists. Ours was one of them. An alabaster island within a black granite pool is nestled in the axis of the National Mall between the Washington Monument and the Lincoln Memorial. The island glows at night, lit from below. A Hall of Honor lies beneath, the island’s surface also the ceiling of an alabaster cube with luminous walls, ceiling, and floor. The project is comprised of symbolic built elements: the cube whose roof is the glowing island is intersected above and below ground by two axes. The east-west axis represents time, while the axis running north-south represents space; the two weave together the war’s space and time into one cloth. Procession down this promenade turns Island, Cube, Space-Time axes into memory in motion: walking across the island in time--1931, 36, 41, 45 marked along the path-- down the ramps inscribed with the spatial maps of the war --Europe, Asia, America--through the Hall of Monitors showing individual histories, pausing in the Hall of Honor, exiting up to the mall and the end. By day the pool’s black granite disappears beneath jets of white water. On special occasions, the pool is emptied, and its large granite surface is used as a ground for parades and other public events. The glass star inserted at the center of the island refers to the star banner used by thousands of Americans during the war to indicate they had a family member at the front.